A few months ago I saw someone in a Facebook horror group showing off their copy of a NEKRomantik comic put out by Weissblech, a German horror comics publisher. I inquired where I may find an issue myself and they pointed me to the comic's artist Martin Trafford's Facebook page. So I messaged him and quickly got a response directing me where I could pick one up. 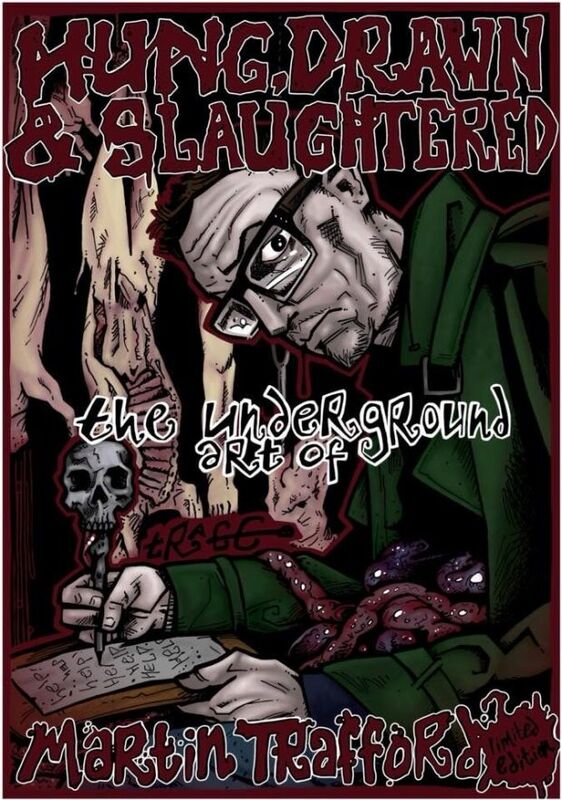 After getting the book and absolutely loving it, I did a little digging on Martin and saw that he has worked with a bunch of my favorite indie horror filmmakers like Ron Decaro (The Gateway Meat), Scott Schirmer (Plankface) and Ryan Nicholson (Gutterballs). He has also worked with Vultra Video, Capps Collective, Helvete Video, Underground Gorellectors, Oldskull, Toxic Filth, Klayton Dean, Arrow Video, Larry Wessel, The Insomnia Collective, Ulkurzu and Blacklava Entertainment! Now and possibly for the only time, Martin has collected many of these artworks into a limited edition, signed and numbered art book which you can pre-order your copy through his crowd funding campaign. There is a choice of soft or hardback, also perks for original art! Right now there is also a referral competition in which the prize is an original eyeball plucked from the eyeball tree from the movie Headless! Please check out the project HERE and help him reach his goal by August 20, 2017! Welcome, won't you stay a while? Don't be shy, stay a while. All contents © and ® ™ Cinesploitation Any images or video were used with permission. Awesome Inc. theme. Powered by Blogger.